The job vacancy for a new warden on a tiny island with its own natural swimming pool has been filled. 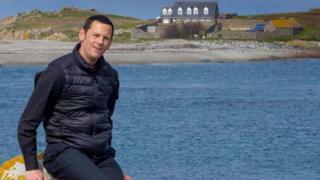 Steve Sarre will take over the role on Lihou Island, which is about 500m off the west coast of Guernsey, next month. He will receive a tractor for a company car and live off grid, while maintaining the one house on the island and looking after wildlife there. The former press photographer said he was feeling "very enthusiastic and excited" about his "magical" new job. Mr Sarre stayed on the island for a few nights before accepting the role to "get a feel" for the place. "I think whoever took on the role, it would be a massive career change for them. "Where do you pluck a person like that out of the air from? It's a bit of a niche market," he said. Mr Sarre had an interview and a practical skills test where he taught team games to local schoolchildren. He said there were four "top candidates" being considered. "I was just lucky," he said. "There's a lot to the job - it's more than just driving a tractor. "As the seasons change, the island changes and there are different birds and wildlife around to look at. "I want to get people engaged and get young families over there," Mr Sarre added. One of his first projects is to get central heating on the island to help increase booking times. Lihou Island has a rich history, with monks from Mont St Michel the earliest known settlers. The house was built in the 1960s but became derelict a few decades later, before being rebuilt and refurbished by the Lihou Charitable Trust in 2005.